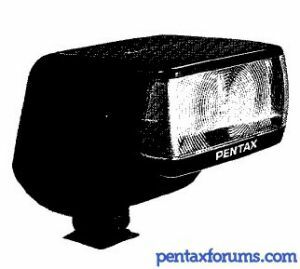 This flash was designed for PENTAX film autofocus cameras and has a guide number of 33 (ISO 100 in meters, 85mm zoom position). The flash has a zoom head (28mm to 85mm) which is automatically set by the camera (can also be zoomed manually). The flash also has an autofocus spot beam. On manual focus cameras and cameras without TTL flash support the flash can be used in manual mode only, and none of the dedicated functions will work.